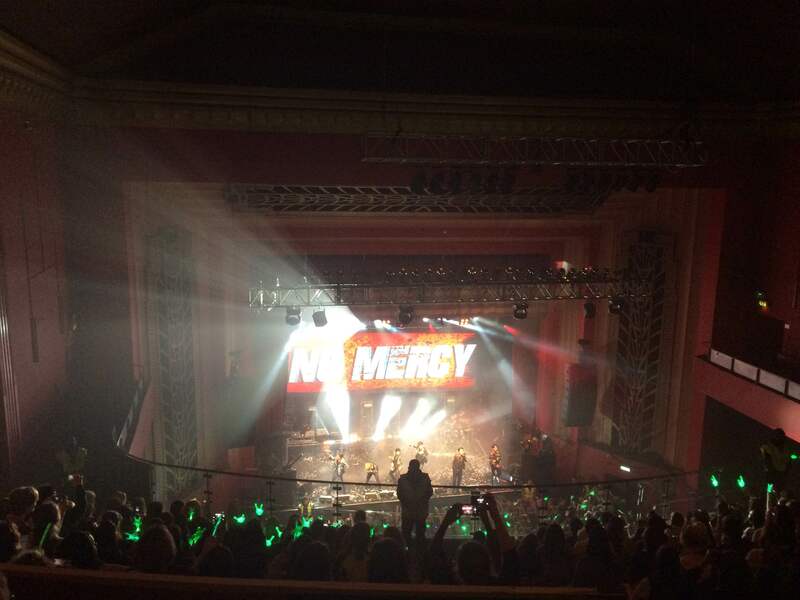 BAP – Live at the Coronet, Elephant and Castle, 13 May 2016. Sold out – and could have been sold out three times over, from what I hear. TLDR: the venue was awful but BAP lived up to their name! Do you want the good bit or the bad bit first? On the other hand, I cannot fault the organisation or staff. Prior to arriving at the venue, I wondered how the staff were going to handle 2600 teenagers, given that pop gigs are not normal fare at the Coronet, but I was impressed with their pre-planning. They were ready for the line outside (which wrapped itself around the block, leading to bemused locals asking me what was going on. ‘Kpop? Oh, you mean like Gangnam Style?’) with barriers and out-sourced security patrolling keeping order and ensuring space on the pavements for passers-by. Official merchandisers wandered up and down constantly, calling out for those who had pre-ordered merchandise. They checked off names and handed items out, rather than have a mad panic inside before the gig. Plenty of bootleggers too … Afterwards, they emptied the audience out in controlled sections which was such a relief. I’ve been to Foo Fighters’ gigs at the MEN when it’s match night at Old Trafford! They started letting people in two hours before the venue in orderly batches so the line was moving slowly but steadily. This kept people happy while waiting. Inside, there was plenty of help to find seats and the aforementioned security came inside for the duration of the gig. I felt for them as they clearly had no idea what they were experiencing but every time one of them dared to patrol in front of fans, they were politely yelled at to get out of the way. After all, most Kpop fan fiction begins with ‘… and then his eyes found me in the crowd …’ and he can’t do that if there’s a security guard in the way. As for the band … they didn’t make the fans wait more than ten minutes after the last audience members came in. Their pre-show videos, lights and soundtrack weren’t too repetitive, eliciting squeals and screams from the audience, building up the excitement. Finally a countdown from 10 appeared on the video screen and the place went mental. When BAP appeared on stage and took up starting positions, looking a bit stiffer and more nervous than I expected, the roar from the crowd was literally deafening! The opening chords of ‘Warrior’ set off cheers galore and the smiles I saw all around me were actually touching. The love for this floor stomper from these six boys was tangible, and by the third song in, they had loosened up and were visibly enjoying themselves. Later, one of the band members (I think it was Daehyun) told the audience via a translator that the UK was the market all musicians wanted to crack, so perhaps that explained their initial uncharacteristic lack of confidence. They performed all their singles but one – ‘Stop It’, which I’d been looking forward to – with all the accompanying dance routines and several costume changes. The balcony audience weren’t allowed to stand up, but there was plenty of armchair dancing following BAP’s movements. And kudos to their stamina: BAP sang totally live while performing the dance routines in full! And sometimes in leather … Pretty astonishing, as Korean pop dances are notoriously complex and energetic. Given the devotion of international Kpop fans, it came as no surprise to me that the audience sang along in Korean, but BAP seemed taken aback and beyond touched to hear their lyrics being sung back to them. They grinned and encouraged and clapped the audience. Their levels of interaction with the crowd were way above what you’d expect from a Western band – ditto their humility! Almost all the band members performed some kind of solo or duo song, including Jong Up, and Young Jae even sang a song in English. Their back up dancers were of the usual high quality we’ve come to expect from Korean bands, and an on-stage DJ took wonderful care of the backing tracks and sound effects. The show-stealer, however, was a drummer. Quite why they had a drummer when their sound system could have provided the percussion I don’t know, but equally, I don’t care: given the full-on, driven nature of BAP’s music, the drummer was a hero. Over two hours of upper body work out … it would have killed me, but the fans loved him. Thankfully a translator had been hired so BAP got to express themselves in proper English. Most memorable amidst the gratitude for the two years of waiting was maknae Zelo’s comments: ‘Being here makes me feel like crying’. They all seemed overcome and a little surprised at the loyalty of these fans. Young Jae even shouted ‘Who is me? ?’ and was as happy as a puppy when the audience yelled his full name back at him. As a sidenote, the audience were asked to be quiet while the band spoke and for the most part complied, apart from my daughter. 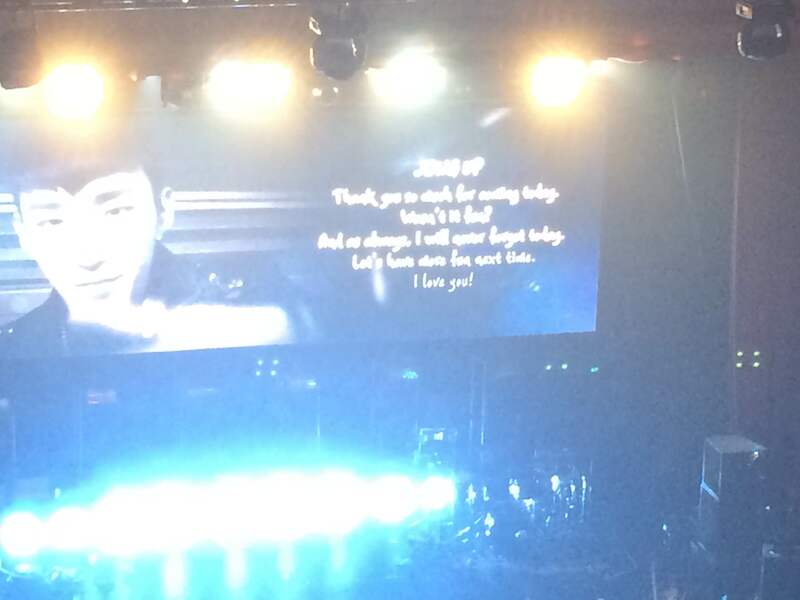 Suffice to say that Moon Jongup is now well aware of how much she loves him (in Korean)! 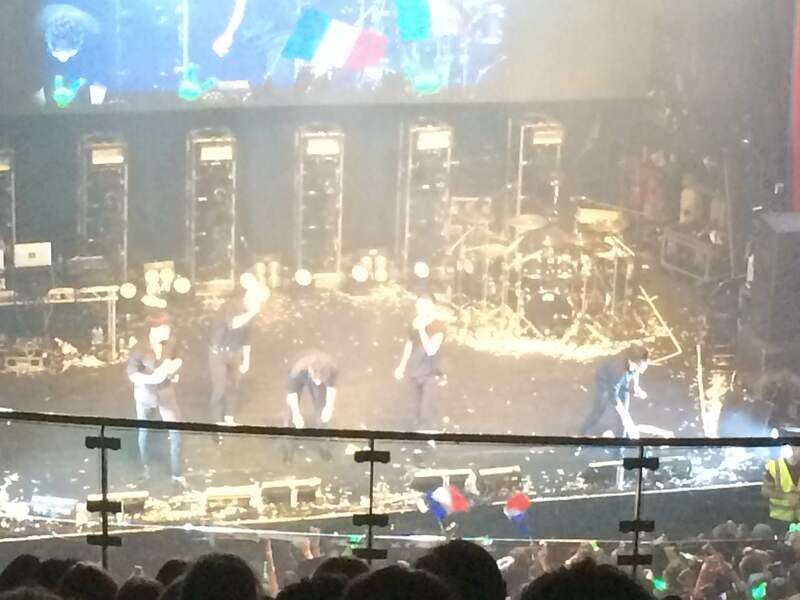 The encore was hilarious: BAP clearly did not want to leave. Yong Guk ripped off his t-shirt and jumped into the pit, followed quickly by four of the others (Himchan wasn’t having it). They performed the requisite two songs, mucked about a bit on stage and in the pit and then sort of did a couple more, even repeating a song from earlier in the show. I seriously think the only reason they left the stage was because they ran out of energy. Daehyun even hung around after the others had left, basking in the adoration and attention. I left wondering who’d had the most fun: BAP or the fans.